(Bloomberg) -- Saudi Aramco may be the world’s most profitable company, but that likely still won’t be enough to persuade investors the energy behemoth is worth $2 trillion. New financial details, disclosed today by Moody’s Investors Service, show a company that paid $58.2 billion in dividends to the Saudi government last year. 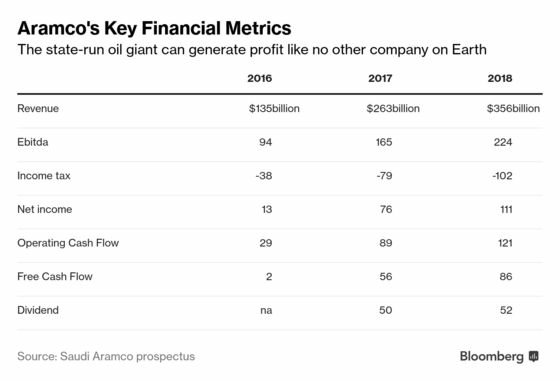 Working back from that, the valuation would be closer to $1.2 trillion if investors judge Aramco by the same metrics as other giant oil companies. Saudi Arabia has stuck to its original $2 trillion aspiration, even after some investors made it clear in the early stages of the mooted initial public offering that they didn’t share that view. Aramco instead pushed back the timeline for its IPO to 2021, from 2018, and embarked on the acquisition of a majority stake in petro-chemical group Sabic worth about $69 billion. It’s in the context of that purchase that Aramco’s financials are being released to prospective bondholders funding the acquisition. They may look for comparisons with other energy companies such as Exxon Mobil Corp., Royal Dutch Shell Plc, Chevron Corp., Total SA, and BP Plc, who on average offer a dividend yield of 4.9 percent. Applied to Aramco’s dividend payout last year, that implies a valuation of about $1.2 trillion. If however investors demand a higher yield to compensate them for the risks involved with the government continuing to control a majority stake, then they might set the valuation even lower. For example, if they were to seek a similar yield to that of Shell, 6 percent, the valuation would drop to just short of $1 trillion. It will all depend on what metrics investors choose to focus on. Those favoring price to earnings or enterprise value to underlying earnings, for instance, might well value Aramco higher. But right now in an era of vanishing yields, dividends are king, particularly in the hydrocarbons sector where worries about stranded assets are multiplying, even if they aren’t shared by Aramco’s management. Aramco declined to comment via a spokesperson. While Moody’s gave a dividend figure of $58.2 billion, Aramco itself in a presentation to potential bondholders said its “ordinary dividend” was $52 billion last year. There wasn’t an immediate explanation for the discrepancy. Saudi Arabia has a few options to boost the valuation before resuming efforts on the IPO. One way would be to cut the amount of tax the company pays, something the government already did in 2017. Aramco paid $102 billion in income tax last year, almost double the dividend amount, according to the presentation to potential bondholders. A further cut would reduce tax revenue at a time when the state is already struggling to cover its budget. Aramco’s acquisition of a stake in Sabic and the subsequent IPO are cornerstones of Crown Prince Mohammed bin Salman’s economic agenda to move the nation away from its dependence on hydrocarbons.